Topics related to health and sexuality are still largely considered taboo in Lebanon. Upon discovering secret conversations in the bathroom stalls at the American University of Beirut, I set out to create a platform that encouraged college girls to take the conversation online. Beinetna is a Beirut-based youth initiative dedicated to eliminating the stigma surrounding women's health and sexuality in Lebanon. It launched in May 2012 with a password-protected online platform that allows college-aged girls to engage in anonymous conversations surrounding taboo topics that can't be expressed elsewhere. 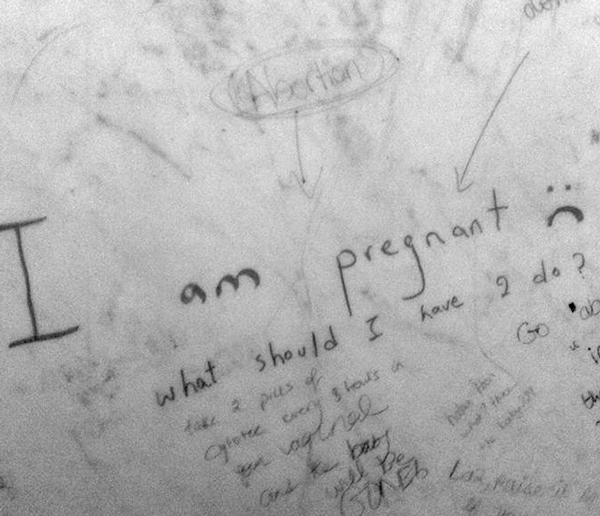 The project started with an interest in scribbles on the walls of the girls' bathroom stalls at the American University of Beirut- where serious conversations were occurring back and forth between female students, mostly related to sexuality and health. Based on my own personal experience growing, I saw the need for a space for anonymous conversation about topics that are usually not addressed at home or in social circles. To announce the launch of the platform, stickers were plastered in the bathroom stalls with the website link and password, which first played a teaser video about Beinetna. Beinetna takes an unprecedented approach to tackle the topic of women's health and sexuality in the Middle East. Rather than communicating the issue in a serious and hushed tone, it takes on a friendly and approachable attitude in both its language and aesthetics- speaking to girls as a friend rather than an authority. It maintains the link to the original bathroom stalls, using handwriting and tiles as the main components of the identity.